Ketav Consultant is a organization having the well established & growing engineering company situated in Ahmedabad. Established in 2005. It has commendable achievements in the field of design, manufacture, installation & commissioning of Evaporators, Vacuum Ejectors, Vacuum Pumps, High Pressure Pumps, Mechanical Boosters, Heat Exchangers, Condenser etc. The asset of the company is young and experienced Engineers who had good theoretical knowledge and sound practical experience. Our range includes falling film evaporator, forced circulation evaporator, heat exchanger, vacuum pumps, steam ejector, crystallizer, descaling chemicals, milk plants, milk evaporator plant, evaporator, vacuum evaporator, water pollution, mvr evaporator, condensers, vacuum system, high pressure pump, systems to remove environmental waste, systems to remove chemical waste, etc. We are an ISO 9001:2008 certified from TÜV Rheinland. Successfully serving various industries, our range is highly preferred by the industrial clients who want quality at reasonable rates. We are also making available high quality chemicals that have wide application area. Apart from these, we also offer clients waste water treatment chemicals, that are generally used in evaporators, boilers, heat exchanger and condensers. We are trusted for Manufacturing and Offering systems with superior functional features as well as for our highly effective range of chemicals. To ensure the trust and confidence of our clients, we constantly work to improve our range making it meet international standards. The raw material used like graphite, iron and other metals, are of top-notch quality that is well-tested before they are used in production. Every care is taken by our quality experts to assure no defect or flaw exists at any stage. Our quality policy extends to the last stage of packaging, where the finished products are carefully packed with most appropriate material that is suitable for full-proof packaging. The asset of our company is young and experienced engineers who have good theoretical knowledge and sound practical experience. We depute highly qualified and experienced engineers for supervision of erection, commissioning & de-bottlenecking (repair), maintenance etc to achieve desirable solution in on site operations. We have cultivated a healthy work environment that motivates our workforce to give their best. Further, we organize training sessions for our workers to handle new technology that are used in their work porcesses. 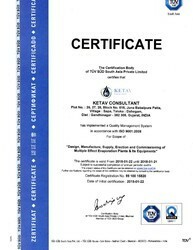 We hold expertise for designing KETAV brand of evaporation plants. Capacity & operational data, including quantities, operation hours, change of product, controls automation etc. Required operating data, such as steam, cooling water, electric power, cleaning agencies, spare parts etc. Site conditions such as available space, connections for energy & product, structural materials for service plat forms etc. Choice of materials for construction & surface finishes. Personal costs for operation & maintenance. Capital & other financial costs. Standards & conditions for manufacture, delivery, acceptance etc. Over the years, we have developed sound understanding of the diverse industrial requirements. It helps us to manufacture systems and chemicals that satisfactorily serves the exact needs of our industrial clients.